At Dumond’s Custom Furniture, we’re proud to say that each piece of our custom wood furniture is meticulously hand crafted right here in the USA. Using beautiful and unique hand selected wood slabs from around the world, we build reclaimed wood beds and headboards like nothing you’ve seen before. Whether you decide to order one of the custom reclaimed wood beds for sale below or you decide to have a custom piece made to fit your personal style, you can rest assured knowing that your new furniture is built to stand the test of time. 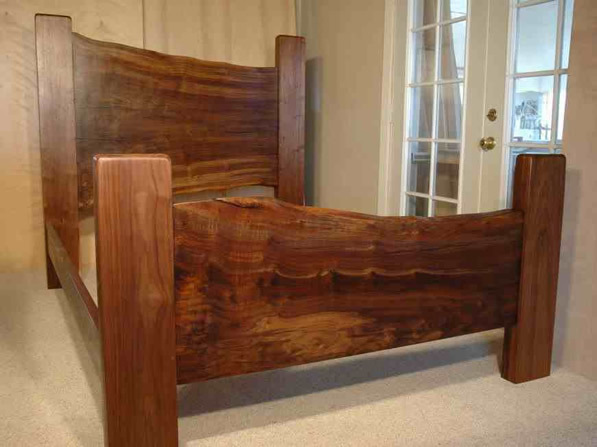 This queen size reclaimed Siberian Elm bed is constructed of solid Pennsylvania Cherry with 6 drawers in the base of the bed. The headboard is made from an Ash slab with Ebony butterfly accents. We build rustic beds, custom reclaimed wood beds, unique headboards and log slab beds that are unique, unusual, artistic and one of a kind pieces of custom furniture. We also build reclaimed wood headboards and footboards from reclaimed and recycled woods. 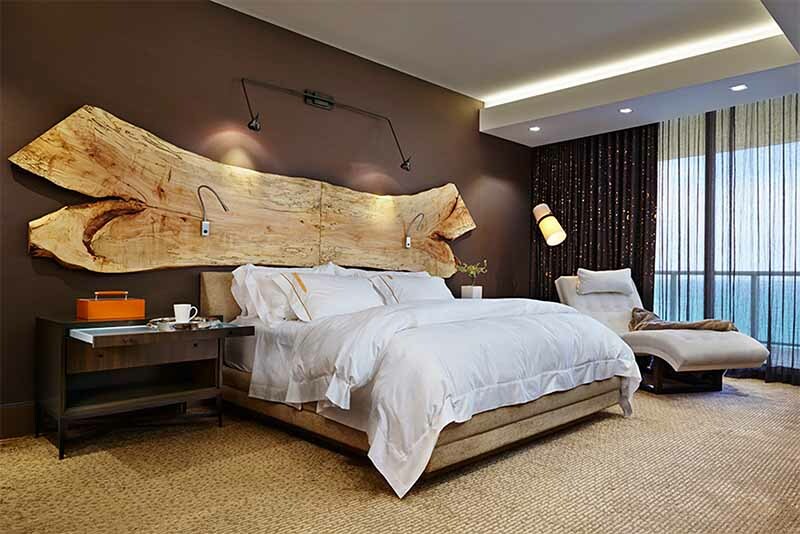 This spalted maple headboard is made of 2 pieces of 7’ long x 26-40” wide crotch maple slabs that are hung on the wall. Lights are surface mounted for additional visibility for reading at night. This headboard was the idea of a talented interior designer in Manhattan. She and I have collaborated on many projects together with fantastic results. See the beautiful room shots in the apartment. The bed itself lives in Florida on Miami Beach in a beautiful penthouse apartment. Walnut slab log bed. We build custom reclaimed wood beds, log beds, slab headboards and bedroom furniture made to order from reclaimed and recycled woods. The “Zovich” Custom Walnut slab bed with claro walnut headboard and footboard. 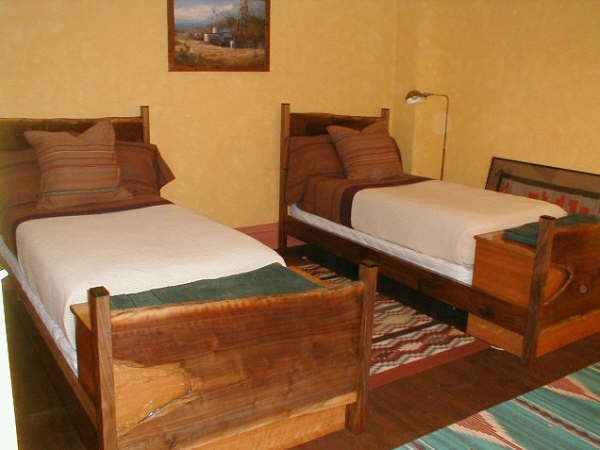 Unique rustic log beds, custom headboards and bedroom furniture made to order. We have a number of unique wood slab beds in stock. If you have an idea for a custom piece, we can build something similar to the slab beds on this page or build you a completely custom wood slab bed to fit your taste exactly. Queen sized reclaimed wood platform bed frame. If you’re looking for a custom-built reclaimed wood bed to fit your home or cabin, we can help you out! Let’s say you already have an idea in mind of a custom bed that you would like to have. You can submit your idea to us via our Request A Quote Form or call us directly at (406) 777-3772. Just describe the type of bed you’re looking for, the size, shape, wood type, and any examples that you might have and we can give you a custom quote. From there, it takes a few weeks to build the bed itself by hand but once it’s complete, it will be shipped to your doorstep within a few weeks.